Sometime this week, I’ll do it. I’ll open up the Scrivener file for the sequel to The Day the Angels Fell and I’ll start the next round of revisions. Of course, I still have normal, paying projects to work on so I’ll be doing these revisions in the early or late hours of the day. But I’m really looking forward to it – I haven’t even glanced at the manuscript for a few months. It will be fun to be back in Deen (and New Orleans, and…the Edge of Over There) with Abra. 2) Right now it’s hovering around 80,000 words, which is pretty close to the length of The Day the Angels Fell. 4) I’ll be independently publishing and offering the book for preorder through Kickstarter. I decided to use Kickstarter again for a number of reasons: the Kickstarter campaign for the first one was so successful (you guys funded it in two days!!! ); it’s a great way to cover the publishing costs (which, if you want to put together a professional book, isn’t a cheap proposition); and it’s one of the easiest ways I can, as an independent publisher, offer the book for preorder. 5) I’ll be looking for folks to help me launch the book later in the fall. If you’re willing to help with that (basically by helping me spread the word with your friends and family and total strangers on the internet and in person via email, FB status updates, Twitter, and megaphone shouting in the subway), let me know in the comments or by clicking the Contact button at the top of the page and sending me a short message to that affect. 6) If you support the Kickstarter campaign at a certain level (I haven’t decided which one yet), you’ll receive a short-story that reveals some VERY interesting information about Sam’s mom. And Abra’s mom, too. Listen folks – they’re not who you think they are. So there you have it. I hope at least a few of you are looking forward to the sequel as much as I am. Here’s a question for you…what are your thoughts on me using Kickstarter to release the sequel? Does it feel okay to you? Does it feel icky in any way? Is it something you’d consider supporting or are you all like, “Um, yeah, already gave you money Smucker so hit the road…” Comment on this in the comments section and I’ll send out a free paperback copy of The Day the Angels Fell to one lucky winner because I’d really like to know your honest opinion. *I initially announced the title for the sequel last week in my newsletter, the one I email out every couple of weeks. If you’d like me to let you know about that kind of fun stuff (newsletter subscribers will be the first folks to see the cover for the new book), you can sign up for the newsletter at the top right of this page. It’s painless. And you can unsubscribe anytime if it starts to feel spammy. 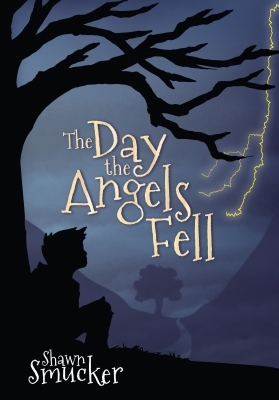 I so enjoyed The Day The Angels Fell, that I cannot wait to read the sequel. While I did not contribute to that kickstarted campaign, I have decided that I will help with this one. As for staying with Kickstarter, if it ain’t broke, don’t fix it! I love your writing, and am proud and excited to continue to read your work. Keep on keeping on! Thanks for the feedback, Dolores. Yay! I am super excited about the sequel. I have a hardcover of The Day The Angels Fell and I’ll probably be participating in and Kickstarter campaign again. Do you have a time frame for it’s release? Thanks, Alicia. I’ll probably do the Kickstarter campaign in August with a release sometime in October or November. That’s the goal right now, anyway. You’ve got a lot of readers who are excited for book 2 – myself included! – who I’m sure would be excited to help make it happen. I say go for it! Definitely excited for the sequel and yes I’ll be supporting it on kickstarter again! You’re the winner, Chad. Message me your details and I’ll get a copy out to you. Thanks! I think Kickstarter is a totally viable option again, and I would happily support it again. There’s no better way to directly support an author, at least I can’t think of one! I’d also be happy to help spread the word when the book is ready to launch. Please count me in! Thanks, Lisa. I’ll be in touch in the next couple of months. Thanks for this post. Afraid I still haven’t managed to dive into The Day The Angels Fell just yet, but nonetheless I’m excited to hear about your plans for the sequel. Can’t remember backing the original book on Kickstarter, which probably means I didn’t…but I’d back the sequel tomorrow. Also keen to be involved with promo when the time comes. Thanks, Casey! I’ll be in touch. I’m glad you’re having fun, Shawn and all the rest of us get to enjoy the product of your joy. Looking forward to helping in whatever ways I can with the roll-out. Kelly, our conversation about the importance of play has been very influential in my writing, so thanks for that. Definitely put me on the promotion list – and yeah, I think Kickstarter is a genius idea. By the way, the winner of the book is Chad M. Thanks everyone for your input.